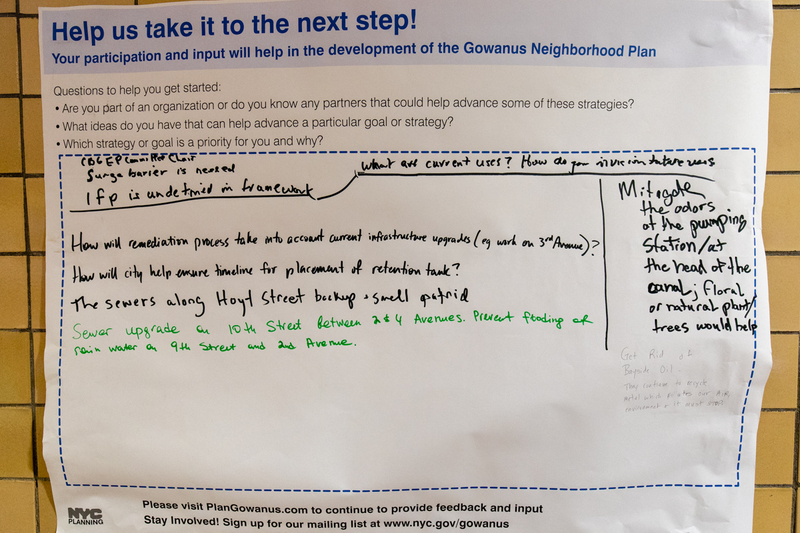 Released in early June after more than 100 hours of workshops and working group meetings, the Gowanus Framework outlines the goals and strategies the community and DCP have devised to make the Gowanus a thriving, resilient, and inclusive place to live and work. 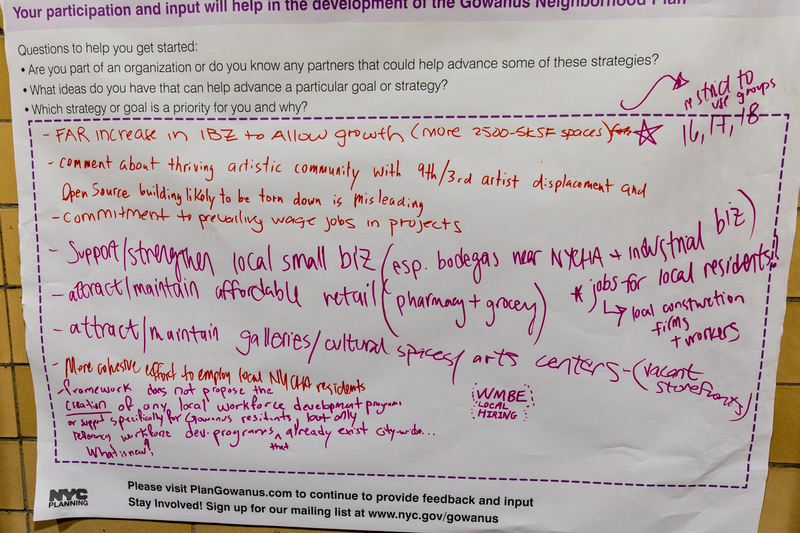 The Framework focuses on community priorities which are divided into seven chapters: Sustainability and Resiliency; Environmental Remediation; Community and Cultural Resources (open space, schools, arts and culture, historic preservation); Housing (affordability and tenant protection, NYCHA, MIH or Mandatory Inclusionary Housing); Economic and Job Development (focusing on the Industrial Business Zone, or IBZ); Transportation; Land-Use and Urban Form (excluding the IBZ). Wednesday’s meeting was set up convention-style, with booths focusing on the seven categories and manned by representatives from NYC agencies including the Office of the Mayor, NYC Emergency Management, Department of Environmental Protection, Office of Environmental Remediation, Department of Housing Preservation & Development, Small Business Services, NYC Economic Development Corporation, Department of Transportation, Department of Parks & Recreation, School Construction Authority, and of course, DCP. Each station had oversized Post-It notes for attendees to write their suggestions and comments. Park said she felt “specifics were lacking in the Framework” regarding schools, so she spoke to a representative of the School Construction Authority and asked her for details about the Framework’s plan for schools. Park was informed that “hard numbers” (i.e., how many students will new housing introduce to the area) are needed before specifics on “school siting and planning” can be discussed. Overall, Park found the event helpful. “I was really excited to see the feedback that our community members left on the walls and the turn-out was amazing. I was energized by the community engagement and inspired by my neighbors,” she said enthusiastically. 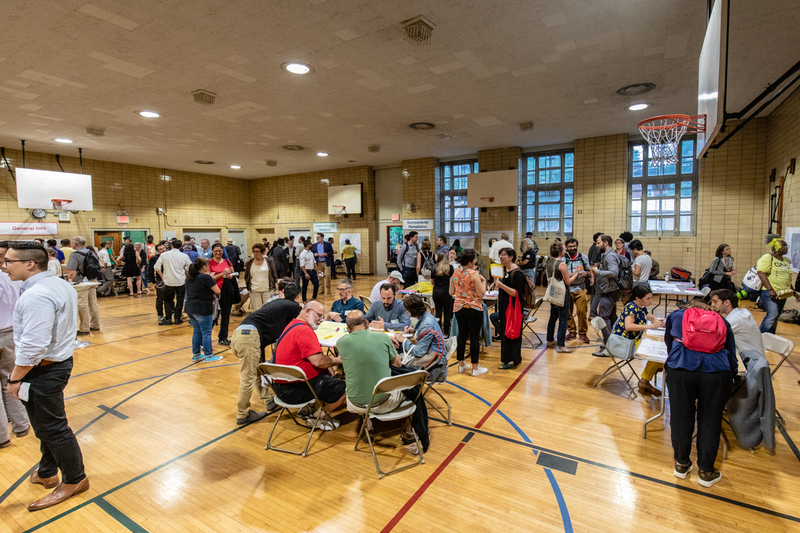 Some were disappointed with the format of the event and would have preferred a presentation similar to the one DCP gave to CB6 on June 11 but with more detailed information. 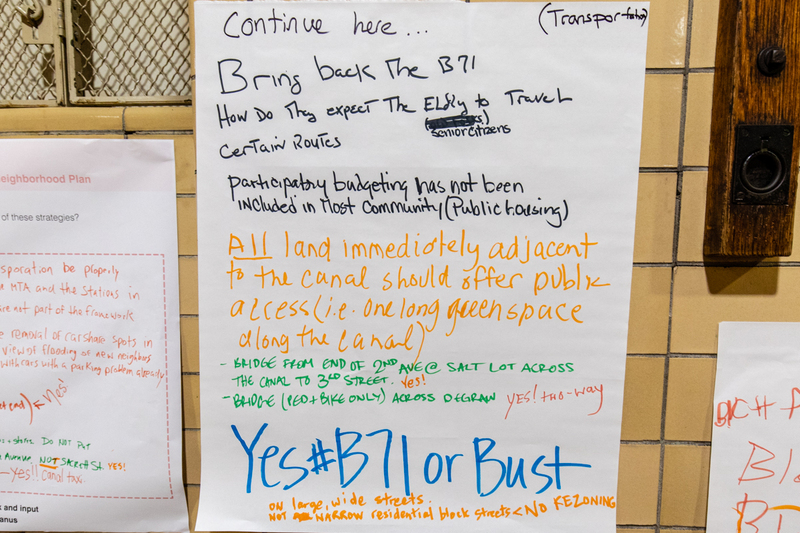 “The Gowanus Framework had been introduced and I wanted to see if there was going to be any more discussion or granular breakdown as to what is going to happen and this is more of like a meet-and-greet,” said Mark Shames, Chair of the CB 6 Environmental Protection Committee, who was assured that there will be subsequent meetings, presentations and discussions. “I would have preferred more of a formal presentation and a question-and-answer session,” he added. Among his priorities for the Framework, Shames would like to see a surge barrier installed at the head of the canal “because we are getting increased storm surge and that wasn’t really discussed,” he said. “There should be an integrated flood plan but there is no definition at all about what that integrated flood plan will or should be,” he added. Another member of the Gowanus Neighborhood Coalition for Justice, Andrea Parker, is also the Executive Director of the Gowanus Canal Conservancy. 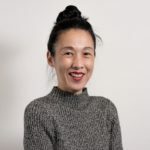 “There’s a whole platform that we have that aims to make sure that we don’t all get siloed into our separate areas [by the Framework], but stand together as a community,” she said. “I think the big things that are missing right now from that platform are investments in the IBZ and in NYCHA,” she added. Parker and her team are suggesting smart solutions such as sensors that can be installed on buildings to control when their sewage gets released into the system and into the Canal. “There’s a lot of great technology and innovation that can happen here, and that’s going to need to happen in order to make it successful,” she said. 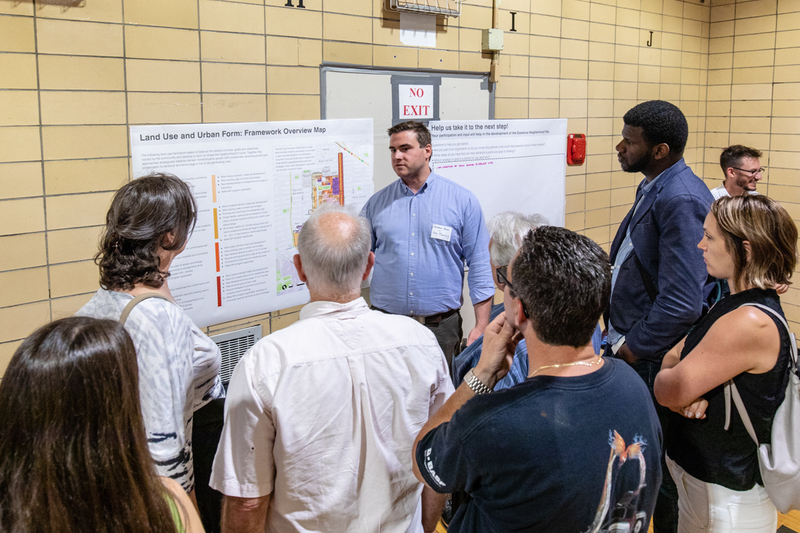 During the open house, Foote passed out a land use map he created with the Dredgers highlighting opportunities they would like the DCP to incorporate into the next step of their process, the Draft Neighborhood Plan. “We’ve gotten good early reception to the Framework. People are digesting it,” said DCP Project Manager Jonathan Keller. 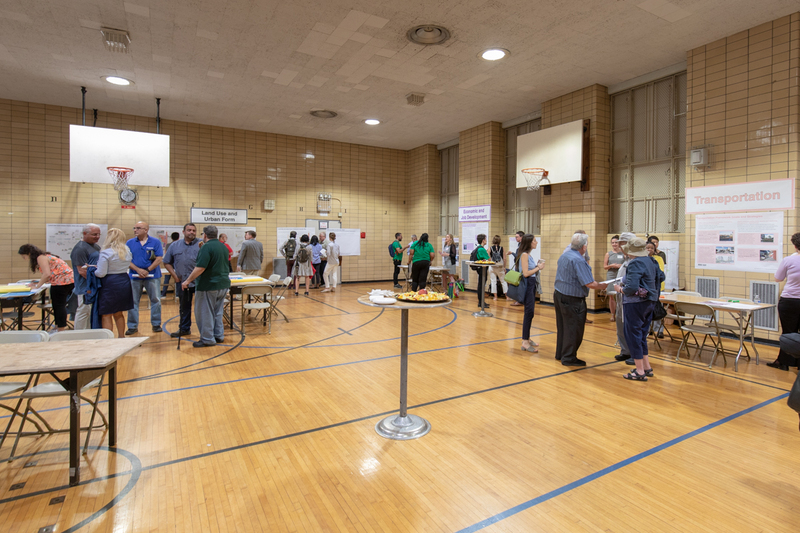 “There are still open questions because we don’t have the zoning that comes with densities, numbers that put traffic onto streets and in schools. 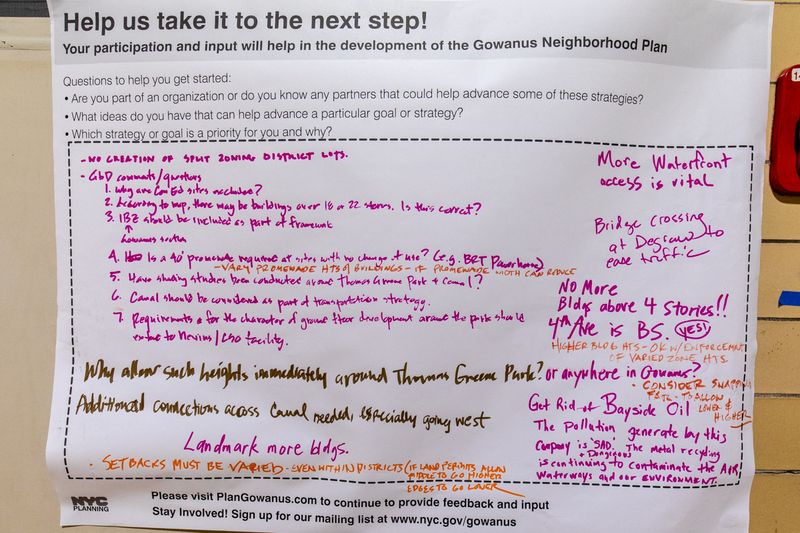 There are still concerns and questions we will continue working on, but we are in the next step to getting there with a Draft Neighborhood Plan based on all this work by the end of the year.” The Draft Neighborhood Plan will include a Draft Zoning Proposal which will provide details and answers to many outstanding questions. “There’s obviously a group that wants us to rezone the IBZ,” Keller continued. “We created an entire chapter in our Framework devoted to what goals and strategies we have that we want to tailor for the IBZ because we want to reinforce it as an industrial and commercial job center. We’ve put in our framework a specific goal and strategy around working with stakeholders [in the IBZ] to identify if additional land use interventions are needed for the IBZ,” he said. A workshop to discuss plans for the city-owned Public Place site will be scheduled in the Fall. 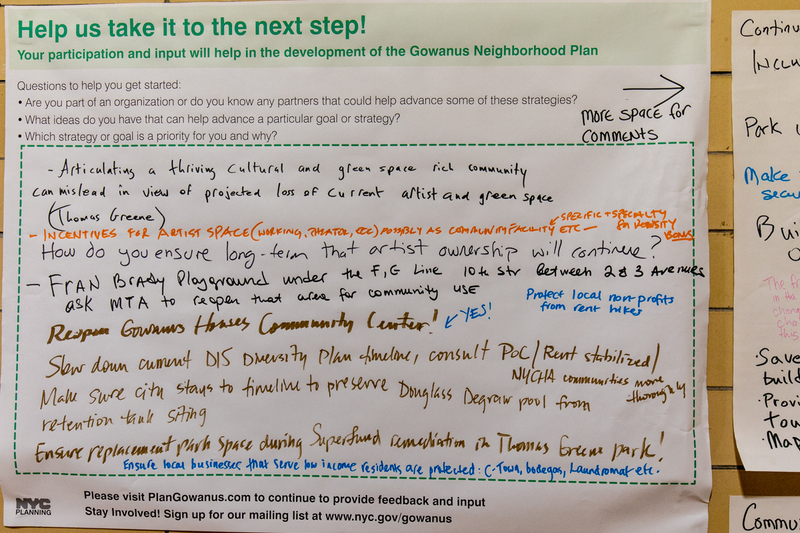 Community members can continue to submit their comments, feedback, and ideas to DCP either via email gowanus@planning.nyc.gov or PlanGowanus.com. 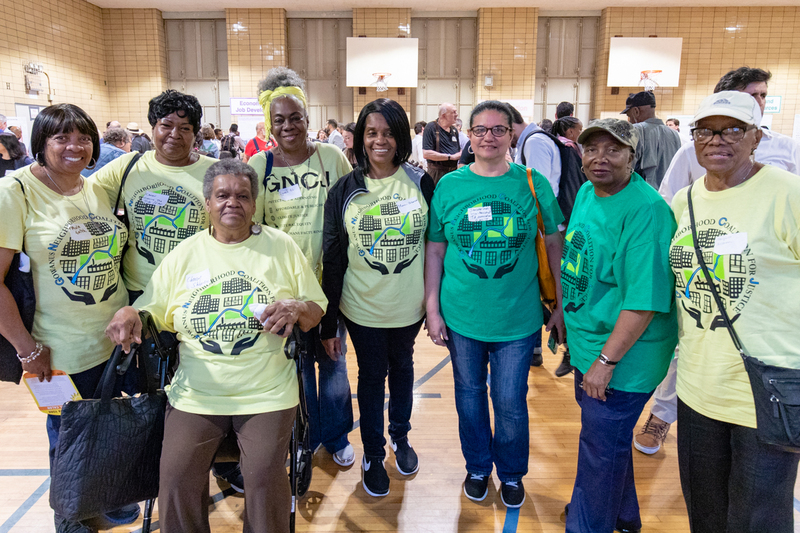 Paula, last week there was a federal consent order officially issued against the city requiring the city to invest $66 billion in upgrades for all NYCHA units. The court order makes clear that all NYCHA residents must get unit upgrades and repairs and that no NYCHA residents needs to bargain with with councilmen and city planners to negotiate for these court ordered improvements. 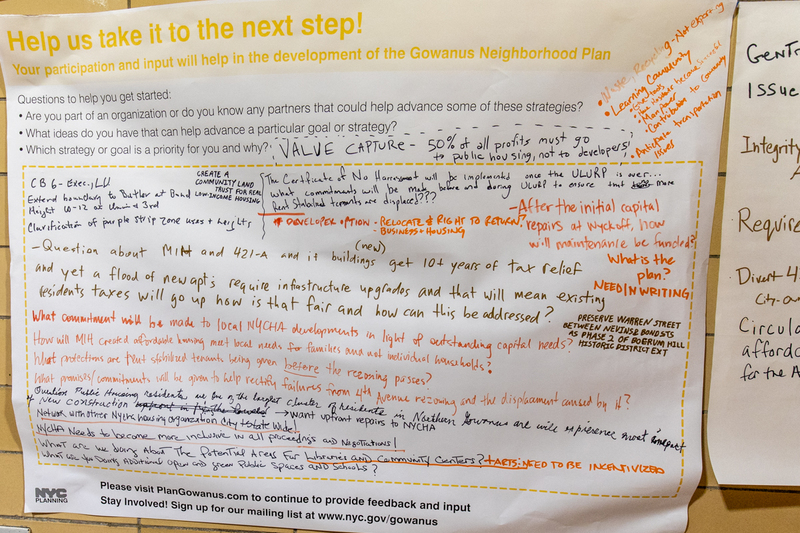 It is so wrong that your elected officials would require you to “go along” with a rezoning that will have so many impacts on the area in order to get the repairs that NYCHA residents are entitled to, now by court order.